Telmatochromis sp. “temporalis shell”. Photo by the author. Experience is the best teacher. I don’t lose as many fish now as I did when I first started in the hobby. Personally, losing a single fish, no matter the reason, hurts. Keeping cichlids can be a risky proposition, but it doesn’t have to be. I won’t get preachy and extol the importance of learning about the fish you keep before you keep them. Nonetheless, you will experience losing fish whether you’re an expert or not. When I’ve encountered a sick or beaten fish, I’ve always made an effort to save them. However, more often than not, I’ve been unsuccessful. I’m not sure whether that’s because I’ve done something wrong, the fish was too far gone, or maybe both. Regardless, I feel I have a responsibility to try. This post is about one of those successes. I’ve been keeping two adult male Telmatochromis sp. “temporalis shell” and an adult female in a 75g Tang community tank for over two years. One of the males paired with the female long ago, leaving the other male destined for bachelorhood. The bonded pair have bred too many times to count. They’re incredibly prolific. Though there has been conspecific aggression between the males, nothing serious has ever happed. That all changed a week ago. 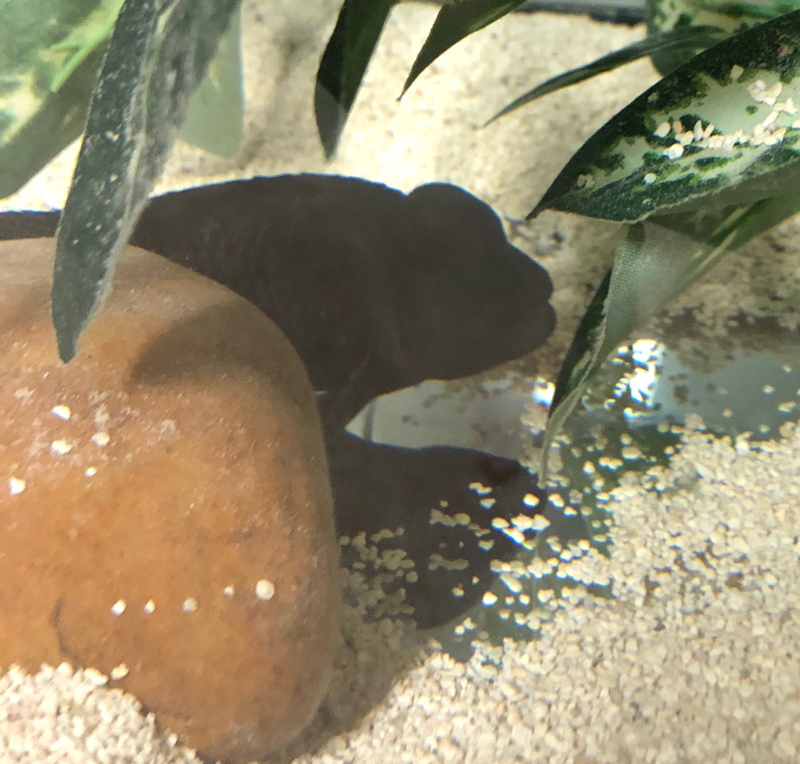 I came in to feed the tank and noticed one of the males lying on his side in a corner of the tank. In hindsight, I should have taken a photo of him, but my thoughts at the time weren’t on making a blog post. He was breathing, but it was physically clear he had been battered pretty good. Though there is plenty of cover in the tank and numerous places he could seek refuge, my guess is he got bashed hard initially, got stunned, and other occupants began piling on before he could get to shelter. I immediately netted him and put him in a 20g long that I had set up a few weeks prior as a quarantine tank for some new fish. The tank was empty, so he wouldn’t be bothered. He stayed on his side for a while, but then he righted himself and stayed propped against a rock. I checked on him frequently. He’d go back horizontal for a while before righting himself again. He clearly was fighting to hang on. I did a water change, turned the lights out in the room, and left him overnight. I honestly expected he would be dead the next morning. Morning came and I checked on him first thing. He was upright, and I did another water change. I continued that routine every 12 hours for the next four days. He remained upright, but I didn’t treat the tank because I wanted to watch him and give him time to settle in. After that fourth day, I treated with an anitbiotic (Kanaplex) as a precaution and did one more treatment two days later. Now, after day 7, he looks really good. His scales have healed and he’s back to looking like I’m used to seeing him (see photo above). I’m not going to put him back in the original 75g. I have another 75g community tank with different Tangs, and he’ll go in there. He’ll have nothing to fear in the new tank because the other cichlids are peaceful species and all juveniles.